Electrocution incidents can be fatal, since the year 2000 25-30 people die from Electrocution in Australia (http://www.erac.gov.au/ ) 90 percent of these deaths involve non Electrical workers! Many more are seriously injured while non-fatal shocks can result in serious and permanent burn injuries to skin, internal tissues and damage to the heart depending on the length and severity of the shock. Electric shocks from faulty electrical equipment may also lead to related injuries, including falls from ladders, scaffolding or other elevated work platforms. Other injuries or illnesses may include muscle spasms, palpitations, nausea, vomiting, collapse and unconsciousness. Those working with electricity may not be the only ones at risk. 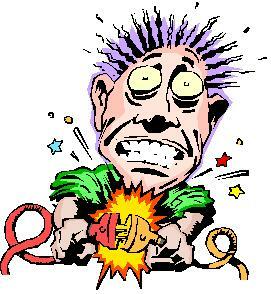 Poor electrical installation and faulty electrical appliances can lead to electric shock to others at or near the workplace. How can I avoid electrical hazards? After the work area has been determined as either electrically non-hostile or hostile, a regular inspection schedule can be developed. It is recommended that regular workplace safety inspections are synchronised with the checking periods which are required for electrical equipment. Non-hostile electrical environment This is a workplace that is dry, clean, With equipment and leads are away from danger from sharps and flexing or anything else that may result in damage to electrical equipment or the flexible supply cord. In accordance with Safe Work Australia: Code of Practice – Managing Electrical Risks in the Workplace, electrical equipment used in electrically non-hostile operating environments does not require tagging. It is sufficient to visually inspect equipment and cords for damage prior to use and thereafter on a regular basis. If ‘YES’ to any of the above, the environment is considered ‘hostile’ according to the Australian Standards AS/NZS 3760 for testing & tagging.. Just as a general guide see the table Below… It is taken from the Australian Standards AS/NZS 3760 for testing and Tagging and it forms the basis of State and Industry testing and tagging requirements. Below is a key for identifying the categories in the table and the type of environment in which they are found. coloured text = Intervals for retesting in a hostile environment. coloured text = Intervals for retesting in a Non hostile environment. coloured text = Intervals for retesting for specific equipment/circumstances without regard to the environment it will be used. Repaired, serviced & second hand equipment After repair or service which could affect electrical safety, or on reintroduction to service, refer to AS/NZS 5762.